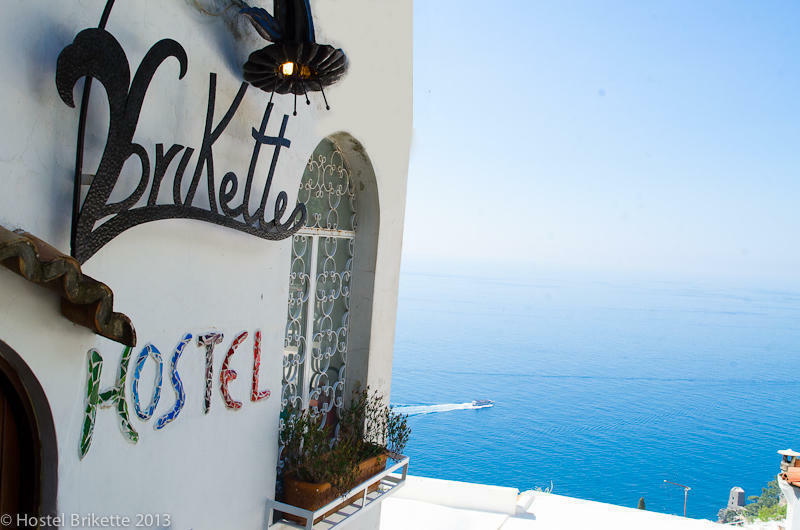 The only Hostel in the stunning and exclusive Positano, Hostel Brikette provides a range of accommodation options at an affordable price. > The perfect base from which to tour Pompeii, Ercolano, Sorrento, Capri, Ravello, and Amalfi - ask about our tours. > Located less than 75 metres from the bus stop. > A large terrace, which provides a truly world class view. > The bar is popular with guests, very keenly priced for Positano, and we regularly organize trips to Positano's exclusive night club (Music on the Rocks) and to Praiano's Africana. > For those who love to walk, the hills around Positano provide for great hiking and breathtaking views - ask about our trips. > Unlimited free WiFi is available in the reception and terrace areas. > Several guide books are available, as is an extensive information pack, which is filled with useful tips and ideas about how to make the most of your time. > High-tech electronic door locks, lockers, and CCTV cameras installed in the Hostel building; 24hrs reception operates during the high season. > If you do intend to drive, street parking is a possibility. If you park in an illegal parking space, or in a space that endangers drivers (i.e. on a corner), you risk receiving a parking fine. If you visit during the peak season, it can be difficult to get a parking space. > There are a minimum of 742 steps to and from the main beach. This means that most people will find the walk back to be quite exercising. If you do not want to walk, there are options. For most, the best option is to catch the bus, which runs every 15 minutes in the main part of the season, and every 30mins during the low part. A round trip is priced at $1,20 euro if you pay before boarding, or $1,60, if you pay on the bus. Many Cooking classes and wine tastings are available please email the hostel to book. > The Salone - our value dorm option - is located near to the terrace and is popular amongst guests who enjoy our night-time activities; if you go to bed early and are a light sleeper, we recommend choosing another option - for example, other dorm options include regular, premium, and female only dorms. > We maintain a 72 hours cancellation policy. > Please do not bring your own alcohol into the hostel, as this contravenes are licensing regulations. Take the train to Naples from which you can follow the Naples instructions, above.